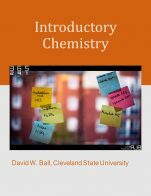 Introductory Chemistry by David W. Ball is licensed under a Creative Commons Attribution-NonCommercial-ShareAlike 4.0 International License, except where otherwise noted. The textbook does not have a glossary, index or table of contents. This textbook is not in depth enough for science majors. However, it might suffice as a prep course for students that have never taken any highschool chemistry. In chapter 4, double replacement reactions are introduced. Yet only precipitation reactions are given as examples even though some of the exercises involve strong acids reacting with weakly basic salts. Arrhenius acid-base reactions are treated separately as neutralization reactions. Also, when single replacement and synthesis (combination) reactions are introduced no attempt was made to present them as examples of redox reactions. Redox reactions are treated separately at the end of chapter 4. Chapter 6 (Gases), is not in depth enough. Kinetic-molecular theory is completely left out. As a result, students will not learn anything about effusion/diffusion or non-ideal gases. Chapter 7 appears to cover basic thermochemistry fairly adequately. However, thermodynamics is not covered deeper anywhere in this textbook. In other words, students are not exposed to the Third Law of Thermodynamics and Gibbs’ Free Energy. Chapter 8 (Electronic Structure) also is not in depth enough. The textbook treads very lightly on quantum mechanics. Thus, the student will never learn the contributions made by Einstein, De Broglie, Heisenberg or Schrodinger. There is a short paragraph on photon energies but no credit is given to Max Planck. In the section on periodic trends, the shielding effect and effective nuclear charge are not mentioned at all. Thus, students will get the false impression that actual nuclear charge and average distance of valence electrons from the nucleus (principal quantum number) are sufficient for explaining periodic trends. In Chapter 9 (Chemical Bonding), the concepts of formal charge and resonance stabilization are not discussed anywhere. In the section on molecular geometry, trigonal bipyramidal and octahedral geometries are left out altogether. Also, students are not even introduced to molecular polarity and dipole moments. The next chapter (Intermolecular Forces) briefly jumps into dipole-dipole forces but with few examples and little explanation. Likewise, very few examples are given to understand the relative strengths and nature of dispersion forces and hydrogen bonding. 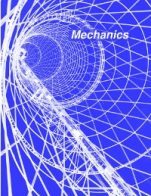 Chapter 13 (equilibrium) seems nearly in depth enough despite the fact that the textbook leaves out kinetics altogether. This chapter includes acid-base and solubility equilibria. However, buffers are only treated qualitatively. Also, the effect of strong acids on solubility of weakly basic salts is not discussed. Electro-chemistry was covered fairly adequately in this textbook although cell potential under non-standard conditions (Nernst Equation) was not covered at all. Standard cell potential also was not related to the thermodynamic equilibrium constant. In the section on electrolysis, there are no stoichiometric calculations involving charge. The final chapter (Organic Chemistry) covers organic nomenclature reasonably well. However, the IUPAC convention for naming of amines and ethers is not used. No mention is made of resonance stabilization of aromatic compounds. Elimination reactions are discussed very briefly. No other reactions appear to be discussed in this chapter. In chapter 3, it is implied that all acids must be in aqueous state (so that H+ ions can be dissolved in water). This works for binary acids (such as hydrochloric acid) but not for oxy-acids such as sulfuric acid. The author does clarify that he will expand on the definition of acids and bases in chapter 12. Lattice energy is not clearly defined in chapter 9 (chemical bonding). In some of the exercises in chapter 9, Lewis dot symbols are somewhat arbitrarily assigned to transition metals (e.g. pair of dots for iron). This is very confusing for students. For clarity, Lewis dot symbols should only be assigned to main group elements. The opening essay of chapter 12 (acids and bases) improperly explains the physiological danger of bases as only needing an H+ ion compared to acids needing an OH- ion. At the end of the chapter, the irritating effect of aspirin to the stomach lining due to its mild acidity is overstated. The content appears to be up to date. The textbook is unified around the theme of food chemistry. From time to time, any new discoveries in relation to food chemistry could easily be updated. The textbook is quite jargon free. At times, the author may have tried to simplify chemical terminology a little too much. For example, lattice energy is not clearly defined and is not placed in adequate context. Intermolecular forces are discussed only briefly not placed into adequate context either (especially in relation to dipole moment). In chapter 4 (sec. 4.7, exercise 4), students are led to believe that fractions shouldn’t be used to balance equations. However, in sec. 7.6, formation equations are balanced with fractional coefficients. Limiting reagent problems are not solved consistently in section 5.6 and some of the examples don’t show the proper steps (e.g. example 4). In chapter 9, expanded octets are shown for some Lewis structures (e.g. SO2, POF3) when earlier examples imply that it should apply when to cases where no other Lewis structure is possible (e.g. PF5, XeF4). The textbook appears to be well suited for being broken up into small reading sections and for the order of sections or chapters to be re-arranged. However, the sections sometimes appear to be broken up too much. For example, chapter 6 (gases) starts off by solving a lot of problems involving the simple gas laws. However, when ideal gas law is introduced in a later section, it is not related to the simple gas laws. Acids and bases are introduced before equilibrium. It is quite possible to move the material in the acid-base chapter to the middle of the chapter on equilibrium before the section on acid-base equilibria. In chapter 3, the naming of ionic compounds (sec. 3.4) and non-ionic compounds (sec. 3.2) could have been covered in the same section. Common ionic charges could have been related to the group number in the periodic table rather than referring students to a later chapter and telling them to memorize these charges. Tables are often spread over two or more pages. Sec. 2.3 (Significant Figures) – Example 3 (pg.64) - Test Yourself: The diagram implies that the width is 0.61 cm rather than 0.63 cm. Exercise 1b, 2b (pg.71/72)– scales don’t look very uniform. Sec.2.4 also doesn’t display the numerator in any the conversion factors. In example 12 (pg. 94), it gets even worse: not only are the fractions not displayed but the second part of the conversion formulas are left out off the solution. Section 3.1 has missing mass numbers in some problems. Many calculations throughout the textbook have inadequate spacing. At times, html tags show up. Some balanced equations are improperly formatted. There are some occasional minor spelling errors. There are no concerns here. Non-SI units are not appropriate in a Canadian context. The bar, the IUPAC unit of pressure under standard conditions, is not mentioned anywhere in the textbook. I should start by making clear that I reviewed the text in hardcopy form. A quick check suggests that the hardcopy version, the pdf version and the docx are similar, or perhaps identical, but there may be differences between the versions that I have not noted. All comments from this point on in the review relate only to the hardcopy version I was sent. 1. All but one of the areas that I would expect to see are covered in the text. The one exception is kinetics, which appears in the majority of introductory chemistry courses in Canada, and all the introductory chemistry textbooks that I am familiar with. There's a good reason for this - it's an important topic! The omission of kinetics cannot be justified on grounds of difficulty: in my experience students find kinetics more straightforward and interesting than some other areas, such as thermochemistry. Nor is kinetics peripheral; it is central to both chemistry and related subjects such as biochemistry. I think it is a mistake to leave out kinetics, and though some instructors may adopt the text despite the lack of kinetics, and construct a course around the material that is there, others will feel the topic coverage is incomplete and look elsewhere for a text. 2. The coverage of remaining topics is satisfactory. The text as a whole is at a low level, and would not be well suited to anything other than a basic chemistry course at school, College or University. This would mean that it would not be chosen for many 1st year University courses that cater for students aiming to be science majors. Nevertheless, many institutions provide courses for students with almost no prior knowledge of chemistry, and this might prove to be a suitable text for such courses. 3. I was disappointed not to find a Chapter list. It would be a simple matter to prepare a 2-3 page list of chapters and section headings; this would provide an immediate indication of topic coverage. 4. Similarly, a glossary would be useful. A first iteration at a glossary could be prepared by selecting each term that has been introduced in bold face in the text and then either redefining it in the glossary, or even cutting and pasting the definition given in the text. Whether definitions are created afresh or merely copied from the text, a glossary should be added. 5. The lack of an index was disappointing, since, with neither an index nor a chapter list, it is difficult to quickly locate an earlier point in the text to check on previous topics. If the text is to be updated frequently, maintaining an index may be non-trivial. Were I using this text in my teaching, a properly maintained chapter list would be an adequate substitute for an index, but to have neither is a disadvantage. There are numerous errors in the text, most of them minor typos, mistakes in the numbering of questions, or formatting problems; these should all be fairly trivial to correct. A list of those I've spotted with be sent separately. There are occasional factual errors, but these too should be quite straightforward to remedy. I was not aware of any bias in the text. Almost all the material in the text is "old", well-established chemistry. There is little likelihood that this material will become dated in the near future. The main area in which obsolescence is a possibility is the use of examples from current life to illustrate chemical principles. It will be necessary occasionally to check that the material about additives in foods, as a typical example, is still up-to-date, but these nuggets of "real-life chemistry" form a small (and useful) portion of the whole, so checking and, if necessary, updating should not be too onerous. The style adopted is appropriate throughout, providing a good balance between the need to define chemical principles accurately and the desirability of engaging students with a relaxed, slightly chatty approach. New terms are defined when introduced and most explanations are clear and lucid. There are a few examples, noted in the list that I will supply separately, in which the structure of the discussion, or the use of a term, varies. However, the overall structure of the book itself is consistent and the number of occasions in which a term is used inconsistently is small. In my view, the text is too "bitty", being broken into large numbers of small sections in which new topics are introduced and then immediately tested. On the face of it this use of very brief sections seems reasonable. However, I fear that students will learn one small piece of chemistry in just a few minutes, test themselves on it, conclude that they understand it and move on to the next topic at once. A degree of reflection is essential if one is to fully understand new material, and the format of this text does not encourage that reflection sufficiently. The approach chosen has a very short "horizon"; I believe there is a danger that the frequent exercises and problems may give students an unrealistic view of how well they have understood the material. This is a tricky issue. Students may find the approach attractive, since new topics are presented in such easily digested bites. I found the short sections very digestible, and I think students will too. I worry about how long the new knowledge will persist though. The author may argue that the end of chapter questions address this, bringing together questions that cover the whole chapter. However, including end of chapter problems does not improve learning, only shows the extent of it. Perhaps my unease is because I have never taught a course that depends upon a text in which new material is so rapidly followed by test-yourself questions. Most texts include plenty of examples of course, but a much smaller number of in-text problems. I'm afraid that I do not know of studies that have looked at this question of how the sections might best be divided, so my concerns may be unfounded. Some of the other reviewers may be more expert in this area and therefore better able to address this. The text is no more self-referential than any first year chemistry text. It would be hard to reorganise the sequence of individual sections of many chapters, since much of the material within a chapter flows logically from simple to more advanced. However, each chapter is largely self-contained, and it would be simple to adjust the order in which some of the chapters are used. Apart from a small number of issues noted in my comments supplied separately, I thought the text was very clear. In numerous places in the text a figure is referred to, but not present. Hyperlinks exist for some of these, but not all. There are also a few minor matters relating to images in the list of corrections to be submitted. The number of grammatical errors is small, though the number of necessary corrections to the text arising from, for example, one word being run into another, is large. These corrections are noted on the list to be supplied separately. No issues of note here. I enjoyed reading this text; there is much to recommend it. The style is relaxed and chatty without being trite or unscientific, the examples and the questions are generally well-chosen, and the number of questions is more than enough for students to fully test their understanding. 1. There are many corrections, nearly all of them minor, that should be made before the text is released to the academic community at large. 2. I am uneasy about the speed with which questions follow the introduction of a new topic. This may diminish the time students spend reflecting on a topic before they move onto new material. However, I presume that this style of text, with a high density of questions, has been tried in chemistry before and been found to work satisfactorily, despite my concerns. 3. The text starts at a very low level. 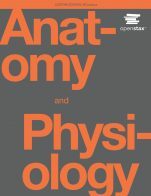 Although it introduces a good range of fundamental topics - apart from kinetics, which should be added - it does not provide sufficient depth for many 1st year University courses. However, it be suitable for typical basic chemistry introductory courses, for which there is a considerable demand, both in Canada and in the USA. In general this textbook has neither the breadth nor depth of content to satisfy the first year chemistry curriculum for B.Sc. student. The current version would be suitable for a massive online open courses (MOOC), high school, introductory college course for students who do not have Chem 11 or a non-science major. I would also like to point out that more content is better than less for a first-year chemistry textbook because it becomes a reference resource for students throughout their academic career. The current edition of the book contains several major flaws: a) the lack of conceptual problems and higher-level thinking problems b) lack of numeracy building and data interpretation/analysis practice and examples c) integrative problems, although this will always be one of the shortcomings to a modular approach --- which I urge the open textbook community to reconsider d) insufficient number and quality of diagrams/graphics f) contains numerous typos and mistakes. To make the content suitable for a first year chemistry course for B.Sc. students, it must include a chapter on kinetics and thermodynamics (not just thermochemistry) and must elaborate on chemical bonding and chemical equilibrium. For brevity, I list only the most desirable additions to make this book suitable for a, however, there are many more minor changes that would improve the quality of the book. Please contact me if you would like more details. This book, at least the print version, suffers from numerous typos that cause both major and minor confusion. These must be fixed in order to be usable for any student. Particular attention needs to be paid towards superscripts and subscripts, and spacing because syntax is critical in chemistry. There are some errors in the accuracy of the content as well. Pg 62, the answer to 337/217 is not 337. Chapter 11, p 633 "Salting Pasta Cooking Water": I disagree with the omission of the van’t Hoff factor in the solution because NaCl is an ionic solid which forms a strong electolyte in aqueous soluiton so must dissociate in order to dissolve in water. I think it is more appropriate to include the van't Hoff factor as an ideal value or estimate the value as somewhere between 1 and 2 (probably closer to the ideal value of 2) rather than ignoring the value. From a student point of view this is especially confusing because the "Salting Pasta Cooking Water" example directly preceeds a sample calculation in which the van't hoff factor is included for a NaCl solution of similar molality. Chapter 12: Sulfuric acid (H2SO4) is listed as a strong acid, but this is only true for the first deprotonantion and should be noted, especially because the hydrogen sulfate ion (HSO4-) and sulfate (SO42-) is discussed later in the book. Chapter 12: Definition of neutral as pH = 7 is not correct, it is only true when the temp is 25 degrees Celsius. Either includes a more correct definition (hydronium conc > hydroxide conc) or limit the definition to 25 degrees Celsius. The quantum chemical view is Chemistry’s most up-to-date understanding of atoms and molecules but this has been largely ignored in this book. I worry that this omission will leave students with an outdated, nineteenth century understanding of atoms and molecules. The text is clearly written and accessible to students. In some places, it would be desirable to use more technical language because students are learning to become fluent and proficient with the terms and should see technical terminology used in the correct context as much as possible. For the students' benefit, some of the example solutions need to include more steps. The most notable inconsistency is the use of a wedged shaped bond to represent a polarized bond. This is confusing because wedge bonds are usually reserved for representing bonds coming out of the plane in VSEPR model. Conventionally, delta symbols or arrows are used to show bond polarization, however, these symbols were not introduced. This text can be used modularly; however, I see this as a weakness. Modular treatment in textbooks lead to a compartmentalized understanding of the subject, which is undesirable. The book needs a table of contents, index and glossary in the printed version. 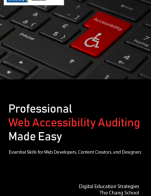 The text version contains regular readability issues in the form of fuzzy text. There are also font size control issues in many instances. In a couple of instances, the html tags are present instead of formatted text. Paragraph and section spacing in the printed version could be improved to enhance organization and readability; for example, a section title that appears at the end of a page can be anchored to the section text so that it starts at the beginning of a new page. It is sometimes not clear when a new paragraph begins. New paragraphs should be indented. The examples that connect chemistry to the everyday experience are good. I would like to see a more global perspective by extending the context of these examples to concerns that are beyond North American boarders. There is also very little discussion of the environment. Regardless of the cultural context, this is a leading concern for our students and society, it is important that students make the connection between chemistry and the environment. The book is text heavy and more diagrams would help to convey the ideas using a different mode, which would be useful for students who prefer pictures to words. The visuals in the book could be vastly improved in terms of appeal and quantity. Discussion of imperial units (ounces, feet, Fahrenheit etc. ), which most Canadian students are unfamiliar with, should be omitted. This is especially true for the section on unit analysis in Chapter 2. The current version is a single, gigantic file which takes forever to download and open, even on a fast computer. To be useful the book needs to be divided into separate files – one for each chapter. The single file version allows the entire text to be searchable, but this takes a long time and often generates too many hits to be useful. In the Preface, the author tries to put chemistry in context for students by supporting the view that chemistry is the “central science”, sandwiched between physics and biology. I feel this hierarchical view of the sciences is antiquated. A more modern understanding is that all the sciences and mathematics, indeed all academic disciplines, are interrelated, each discipline depending on knowledge from all other fields for inspiration and insight. On the whole, this textbook reads at the high school level at best. Though most of the topics necessary in a first year chemistry course at the university level are covered, there is a lack of depth in explanations and concepts. With this being said, this text is far more suitable for students that are inexperienced in general chemistry and require the most basic of background information before entering the more detailed first year chemistry curriculum. The text does include a substantial number of figures that support the written text; however, the figures that are included are, for the most part, not visually striking and therefore may not support learning while assisting in maintaining student interest. The addition of a table of contents, index, and glossary is required in order to allow students to find specific information easily in the hard copy. Many first year students rely heavily on chemistry text glossaries to supplement their learning and studying as first year chemistry courses typically introduce students to a large number of terms and definitions they are not familiar with. Other than the several typos throughout the text, the chemistry described throughout is tried, true, and accurate. Though diagrams support the text, they tend to lack visual appeal and sometimes appear unnecessary. There does not appear to be any bias in the text, though more discussion of SI units and less discussion on conversion of imperial units to metric units in Chapter 3 would be beneficial. The content in this text consists of principles of chemistry that have been well accepted for a number of years and will likely remain so. With this being said there are some notable additions that are necessary for modern first year chemistry courses at the university level. The text explains VSEPR theory quite well while focusing on the Bohr model of the atom; however, Molecular orbital theory, the Quantum Mechanical model, and reaction rate kinetics are not discussed at all. Though these are more difficult topics for students at the first year level, they complement, and can even assist in student’s abilities to understand many of the other topics discussed in this text, and thus should be included. Though the text spends a brief time discussing the calculation of pH, it does not discuss buffers in significant detail. It also does not introduce the Henderson-Hasselbalch equation so students will not learn how to easily calculate the pH of weak-acid buffers. As this is a topic that is utilized in many sub-disciplines of chemistry, it should also be included in more detail. The text is written in a very clear manner. However, I feel it is overly concise and at times over simplified. Students in a first year chemistry course should be learning the technical information behind concepts as this information is going to be referred to for the rest of their careers. This text uses relatively lay terminology to describe concepts. The text seems to be consistent throughout with no major issues to note. On the surface this text appears to be ideal for modularity. The many small sections could be easily rearranged as needed to fit into a course as desired (and may actually be required in order to help material flow better) and these sections do not heavily reference other sections in the text. That being said, the end of section questions will not engage students in enough depth to truly test their understanding of the concepts at hand and instructors will likely wish to complement these sections with additional assignments or testing. In addition to a lack of a table of contents, glossary, and index, the text has been arranged in a manner that may be undesirable for many instructors and could place student learning at a detriment if taught using the current order of chapters. Though the questions asked in the “Test Yourself” and “Exercises” sections are highly applicable, the answers are placed immediately after the question. This can be less conducive to student learning as many of these answers are on the same page as the question making completion of the question without looking at the answer very difficult. It may also be more conducive to student learning to introduce chemical bonding and states of matter early in the text. It is beneficial for students to understand these concepts before discussing other topics in greater detail. It may also be beneficial to move VSEPR theory and molecular geometry to later in the text as is can be more easily understood for many students after chemical bonding has been discussed in more detail. Additionally, it may be more desirable for some instructors to move the discussion on solutions and concentrations closer to the chapter covering the mole and stoichiometry while moving the section on Redox reactions to be included with the chapter on oxidation and reduction. Simply rearranging the order in which these chapters are discussed can easily accommodate these issues when using this text but will likely require additional planning and preparation on the part of the course instructor. 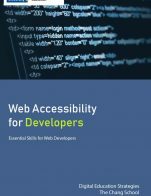 As a hard copy of this text was reviewed, the largest issue navigating the text stems from a lack of table of contents, which would be useful in quickly finding chapters of interest. Additionally, the hyper-links are obviously not of use in the hard copy, which becomes problematic when trying to view some of the figures that are hyperlinked to the text in the PDF version. In order to use these hyper-links, students/instructors appear to be required to sign into an online service in order to view the material, which is less than desirable for some individuals. This is in addition to multiple typos, including areas where html tags are still visible instead of the properly formatted text. The text contains several grammatical errors including small sections with numerous html tags remaining in text or occasional sentences that end mid-sentence or with half of a word before moving to the next paragraph. As this is a chemistry text and questions do not utilizes any cultural perspectives, there is nothing to note. This text is easy to read but lacks a more technical perspective that first year chemistry students are expected to learn at the university level. Though the overall organization of the text may be less than desirable for some instructors, the fragmented organization can be easily pieced together through a more modular teaching approach. The text on the whole does not provide substantial depth or technical background in many of the topics discussed. Although it may not be appropriate for the first year university level, it does provide enough depth to supplement a general interest chemistry course or an adult upgrading course for individuals seeking high school equivalency before entering university level coursework. Additionally, the discussion on conversion of imperial units to metric units in Chapter 3 is not relevant in Canada and is not often seen in other chemistry texts used in Canadian universities.